(Nanowerk News) A team of scientists has revealed how certain harmful bacteria drill into our cells to kill them. Their study shows how bacterial 'nanodrills' assemble themselves on the outer surfaces of our cells, and includes the first movie of how they then punch holes in the cells' outer membranes. The research, published today in the journal eLife ("Stepwise visualization of membrane pore formation by suilysin, a bacterial cholesterol-dependent cytolysin"), supports the development of new drugs that target this mechanism, which is implicated in serious diseases. The team brings together researchers from UCL, Birkbeck, University of London, the University of Leicester, and Monash University (Melbourne). Unlike drills from a DIY kit, which twist and grind their way through a surface, bacterial nanodrills do not contain rotating parts. 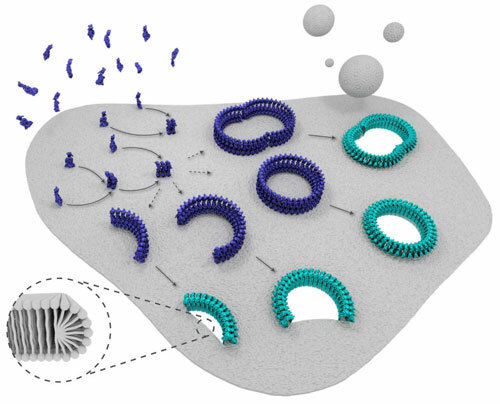 Rather, they are ring-like structures (similar to an eyelet) built out of self-assembling toxin molecules. Once assembled, the toxins deploy a blade around the ring's inside edge that slices down into the cell membrane, forming a hole. Schematic illustration of how suilysin, a bacterial cholesterol-dependent cytolysin, drills holes in cell membranes. To determine how these rings are built, team member Natalya Dudkina made several thousand images of artificial cell membranes coated with toxins, using an electron microscope. Dudkina is a member of Helen Saibil's group at Birkbeck, University of London, which specialises in mapping biological structures using electron microscopy. "Each ring was formed of around 37 copies of the toxin molecule. But aside from complete rings, we also observed arc-shaped, incomplete rings," Dudkina said. "One problem we had, though, was that our method can only record snapshots of the membrane perforation process frozen at different intermediate stages." The solution to this was to produce a 'movie' of what happens when the toxins are placed on a cell membrane. This was carried out with atomic force microscopy (AFM) at Bart Hoogenboom's lab at the London Centre for Nanotechnology at UCL. AFM uses an ultrafine needle to feel, rather than see, a surface. This needle repeatedly scans the surface to produce a moving image that refreshes fast enough to show how the toxins move over the membrane and then cut holes in the membrane as they sink in. "It was quite spectacular to look at," said Carl Leung, a member of Hoogenboom's lab at UCL. "After the initial assembly of the toxins into arcs and rings, they kept skating over the membrane surface. Then they stopped, sank into the membrane, and started spitting out the material they had drilled through, like sawdust when you drill holes in wood." A big surprise for the team was that complete rings aren't needed to pierce the cell membrane: even relatively short fragments are still able to cut holes, albeit smaller ones, and hold them open, allowing bacteria to feed on the cell's contents. Together, these findings give a detailed view of how these bacterial toxins drill holes in cell membranes. The snapshots from the electron microscopy show how the rings are structured at the start and the end of the drilling process, and the moving images from the AFM show the process as it unfolds. The discovery supports the development of new drugs that can target bacterial nanodrills and help treat the diseases in which they are implicated. These include pneumonia, meningitis and septicaemia. Extensive research into such drugs that is ongoing at the University of Leicester, which also provided a genetically modified form of the toxin to help identify the different steps in the hole-drilling process.